Traditionally Aboriginal people have no written language. Their culture is immensely rich, and they believe the world was created during the ‘dreamtime’, or time of creation. The preservation of their culture is imperative, and this is achieved in many ways- dance, song and via the use of symbols/ iconography. Traditionally symbolism of dreamtime events was presented on the desert floor, on their bodies (as body paint), on cave walls or carved into timber/ stone. In the early 1970s these designs were translated on to boards and then later canvas with modern acrylic paints. So, the paintings we now enjoy are not just beautiful artworks, they are so much more! When an artist paints their dreamtime story (using symbols), they are honouring their ancestors (creators of the earth), and capturing knowledge to be preserved and passed on to future generations. Some symbols have multiple meanings, for instance, concentric circles can represent a waterhole, a campfire or a woman’s breasts. Symbols representing water are of particular importance. When desert dwelling aboriginal people lived a nomadic life the location of water was critical. Many artworks represent a map of the country and identify the location of water sources. Elders would create these ‘maps’ to teach their children where to find water. 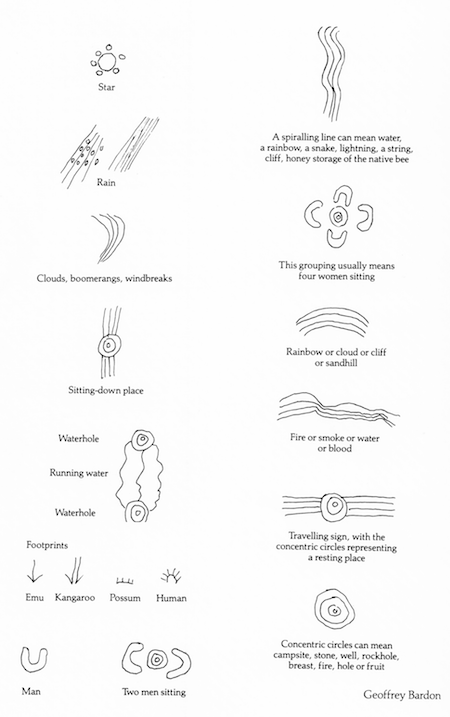 These are just a few of the many symbols used to tell the stories of the dreamtime.